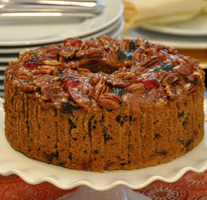 Heritage Baking Company is a business dedicated to making high quality fruit cakes and providing personalized service. The company was founded in 1979 in Whitby, Ontario, Canada with the sole desire of producing top-of-the line fruit cakes made with only the best of ingredients. Our delectably moist fruit cakes have been created using a tried and tested classic recipe which has been perfected by Master Baker Peter Scholtes whose many years of experience in the trade gives credence to perfection. Over the years, Heritage Baking Company has grown in size by continuing to build a solid reputation of maintaining the highest quality fruit cakes and unmatched customer service to individuals as well as the largest of corporate clients. We are now proud to say that we ship our cakes across Canada and the United States. At Heritage Baking Company, our mission is simple. We want to provide you, your family, friends and business colleagues with absolutely the best fruit cake that you have ever tasted.